It’s been a generally cold month in the Dordogne with regular frosts and the very occasional brief snow flurry. Temperatures have been well below zero at times and the lake was frozen at the start of the year. We also had a period of very heavy cold rain towards the end of the month. Fishing With poor weather and lots of work to do around the lake I have had very little opportunity to fish. In fact I have only managed three short afternoon sessions this month. Each of these followed a brief rise in temperature and on each occasion I managed to catch. As I mentioned briefly in last month’s report, 10 minutes into my first session of the year on 4th January I broke the lake’s catfish record with a fish of 85lb 8oz. The fish was caught using the similar bottom bait approach that I have been using across the winter and was again caught on a single spicy fish boilie. The fish put up an amazing fight and took approximately 25 minutes to land. Towards the end of the session just as the light was starting to go I had another run which resulted in a beautifully conditioned 34lb 1oz Common. I was trialling a couple of new spots on the lake today but both fish came from the deeper water off one of the alder trees which always seems to hold fish. After this time, the weather soon got colder and despite the odd brief feeding spell I was committed to getting the 3.5 tons of aquatic chalk (Siltex) into the lake. I finally managed this on 15th and after baiting three spots with a scattering of 20-30 boilies over each I fished the afternoon period. The deeper water spot to the right again proved to be the hotspot and 30 minutes after casting out a slow run resulted in a 41lb 6oz Mirror. This was followed up later in the session with another Mirror of 38lb 1oz. Both fish were again caught on single Spicy Fish boilies. Our blog is now up and running and I have put a post on regarding the bottom bait rig that I use at the lake. My final session of the month was on 19th January. Despite a rise in temperature of 1-2 degrees it remained cold and this session was really a trial to see whether a smaller rise in temperature would bring the fish on to feed. 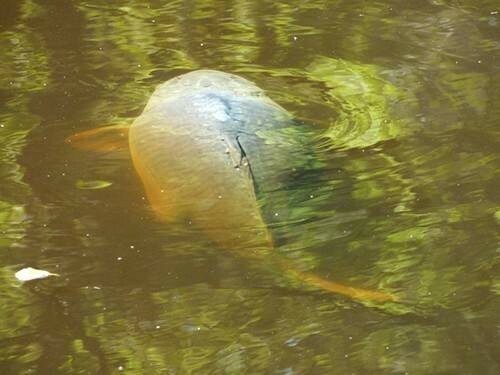 It was fairly inconclusive but despite the lake being very quite I managed one Mirror of 26lb 9oz. So that’s it for the fishing in January. As I write this at the start of February, the forecast remains cold. I do, however, hope to get a few sessions in this month. Most of my time this month has been spent on lake management. The initial work was associated with getting the aquatic chalk into the lake. This was very hard work on my own and involved spreading 140 25kg bags as evenly as possible across the lake. This has now been completed and is likely to now become a regular management tool in maintaining and enhancing the lake ecosystem. The other work has been associated with the completion of the first 50m of improvement along the far bank margin. This has involved installing a series of vertical posts along this margin with horizontal lengths of willow intertwined. The area between the willow and existing bank have now been backfilled with a number of marginal plants translocated from a marsh at the base of the dam to provide instant cover. We also intend to seed sections. These works have certainly been successful and the fish should now have improved depth and feeding opportunities close in to this bank. This should now be much improved for both stalking as well as those anglers who wish to fish across the lake to a tight far bank spot. Whilst it is difficult to tell the scale from the picture, the photo of the fish included with the report is of a fish known as Fran which weighs upwards of 50lbs at any time of the year. The picture was taken by one of our regulars a few years ago and was within 1m of the far bank margin. He managed to get her feeding she appeared to be about to take when a smaller mid thirty pound fish came in and took his bait – exciting fishing when you can watch it all unfold in front of you! So that’s it for January. February will see us completing the work on the remaining sections of the margin and generally getting the lake and fish in prime condition ready for the first fishermen towards the end of March.